When you want beautiful floors that resist the elements, choose durable tile flooring in The Woodlands from Flaherty's Flooring America. Whether porcelain or ceramic, tile is ideal for moisture-prone environments, such as the kitchen, bathroom, and basement; but, it also works great in any room in your home -- the living room, bedrooms, and grand foyer. This flooring surface is not only strong and moisture-resistant, but it has a multidimensional look that makes it a visual masterpiece. Peruse our multitude of colors and styles for flooring that is sure to make an impression in your living space. From classy neutrals to rich browns and pinks, we have a variety of types of tile in our flooring showroom that will suit every theme imaginable. Establish your own unique style. 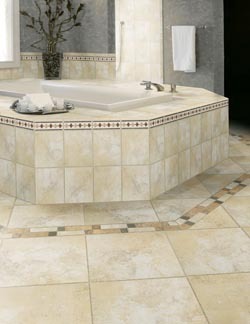 Since tile flooring may be cut into a variety of shapes and sizes, you’re welcome to customize your installation. Whether you’re planning to adorn your surfaces with a single color or a flashy pattern, you’re free to create with tile. Our flooring specialists are available to help plan and coordinate your next work of art. Contemporary ceramic tile is a popular flooring option. It’s crafted from natural materials and fired at high temperatures to create a resilient surface. Ceramic tile is available in a wide selection of glazes and finishes that create a beautiful and strong surface for everyday life. Porcelain tile flooring is fired at higher temperatures, which provides a denser surface. As a result, porcelain is a stunning surface that can withstand spills, impacts and, of course, heavy foot traffic. Porcelain is a beautiful and dependable option for your home, both for indoor and outdoor use. From adaptable ceramic to elegant porcelain, our tile flooring options offer flexibility and strength in one attractive package. Both ceramic and porcelain resist stains and spills with ease, and their tough finishes ensure a robust surface. In effect, tile floors are a low-maintenance option that you can depend on for durability and lasting visual appeal. In our showroom, you’ll find sales and design professionals who are eager and willing to help you. Two of the most popular rooms to tile are the bathroom and kitchen. Perhaps, you would like to install stone tile in the bathroom. Our experts guide you in selecting your best option. Or maybe, you want floor and wall tiles in the kitchen. We can assist you in creating a space that is as appealing as it is functional. Don’t spend your time or resources searching for a reliable contractor. Our showroom offers complete tile flooring installation services. When you hire our installers, your new tiles not only look great, but they’ll last for years. Our installers are certified and have years of experience in the flooring field. From properly mixing grout to laying your tiles, our contractors are meticulous, efficient, and dedicated to delivering excellence with every tile flooring project. In addition, you can expect the best in installation for your wall tiles whether for a shower wall or kitchen backsplash. Contact us today with any questions or concerns you have about flooring your home with tile. We proudly serve property owners throughout The Woodlands, as well as Houston, Spring, Spring Valley Village, and Tomball, Texas.